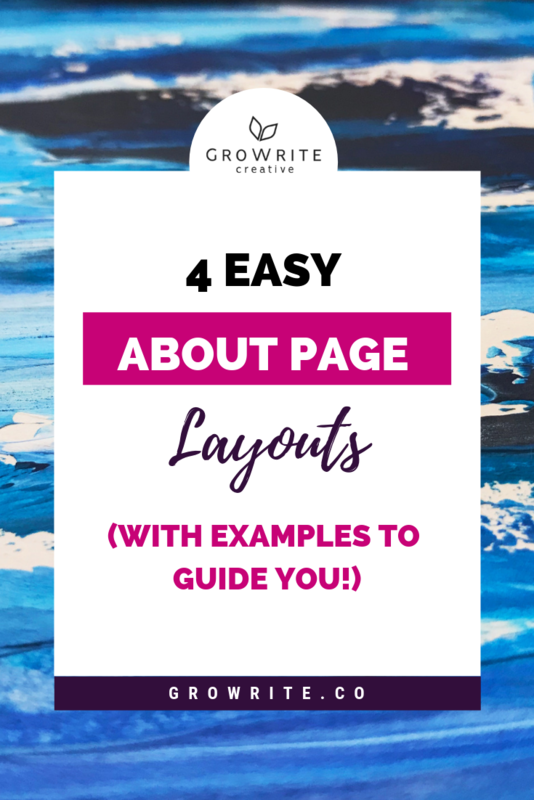 Creating an About Page layout that organizes your content in a high-impact, engaging way doesn't have to be a struggle. This article walks you through 4 simple options and shows you plenty of examples to make the process easy. Because as much as your About page should convey things like enthusiasm and your passion for what you do, it also needs to be easy to read. Even -- if your visitors are time-crunched -- to skim. Seriously, the last thing you want to happen is for your ideal customers to feel confused or frustrated while they're interacting with your site -- causing them to click away elsewhere. These layouts will make sure that doesn't happen. N,b. 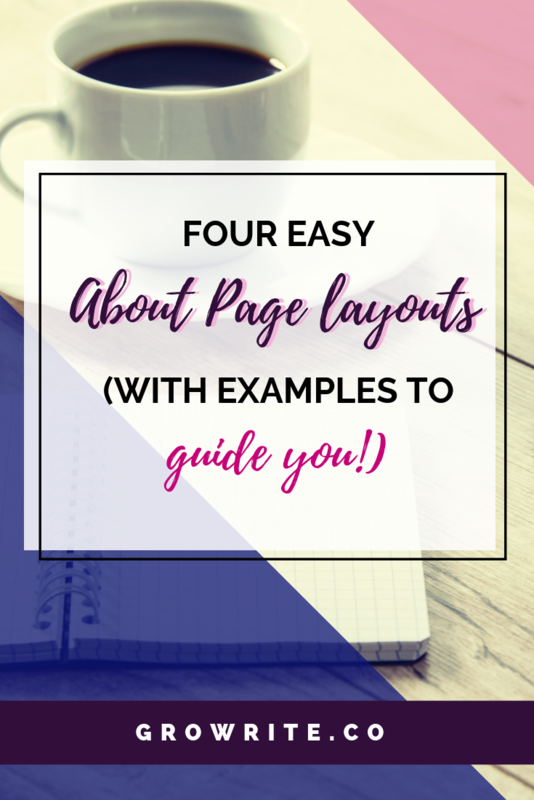 My own About page layout is slightly different to the four described below -- feel free to use it as a fifth option to inspire you! Think of this as your little black dress of About pages. 1. A 1-5 sentence section near the top of the page. This is where you clarify who you are, why you do what you do, the audience you help, and what you help them with. This could be your company’s mission statement, your “Hi, I’m [name] and I help…"-type statement, your elevator pitch, or a few sentences that address your target audience directly and outline how you help them. Basically, even if your website visitors click away after only reading these sentences, they should leave with a good idea of what you’re all about (and how you could potentially help them). ​2. A longer section where you tell the story of your journey. This is where you talk about how your company came to exist, your values, your experiences, and anything else that you think positions your business as something kinda special. You can keep it light here or go deep. But don’t forget that reeling off lists of accomplishments can easily come across as a bit snoozeworthy/braggy and that your readers have come to this page because they want some human warmth and/or a good story. So give the people what they want and show some personality here! I think Tim Ferriss could tell his story somewhat better -- it’s very list-of-accomplishments-ish -- but he has an extremely clear short version/long version About page. Amy Porterfield’s page is a great example of this kind of classic structure -- her opening sentence both implies a story (by referencing a journey) AND immediately lets you know what she and her business are all about. Then you can delve into her entire story properly if you want to keep reading. I've mentioned their pages elsewhere in this blog, but Marie Forleo has a beautiful -- and very classic -- About page, as does Warby Parker. Panera bread uses this classic structure in a pretty cool way by having a summary box up top, and then also integrating an infographic that both tells the company’s story and showcases some of their products. This is a great option for smaller companies who just want to get the ball rolling with their About page. It's also a handy option when you have a lot of information to communicate and you want to let your readers pick and choose what they’re interested in learning about. 1. Why did you found your [insert-appropriate-industry] business? 2. What kinds of people do you help? / Who are your clients? 3. How did you train for this? 4. What motivates you in your business? 5. How could I work with/buy from you? Again, this is a great option for smaller companies and personal brands who just want to get the ball rolling with their About page. You can also add a "10 fun facts" list like this to a classic About page layout, to spice it up more and add in an extra personal touch. TIP: if you're using a stand-alone list layout, make sure that at least half of the facts you share are related to your business. Those facts can highlight what you offer, why you're qualified to do what you do, and why you care. But also feel free to throw in some bonus, fun stuff too (favorite food, hobbies, places you've traveled to etc. -- don’t be afraid to inject your list with personality! This kind of a layout makes your About Page incredibly easy for a reader to navigate and skim. It's less suitable for long-form storytelling, but it keeps things very organized. It's also easier and less intimidating for people who don't love writing (or who have a tendency to write way too much...!) to create. If you feel like you need some structure and some very clear parameters to guide you, give this kind of About page layout a try. Come up with your headings first (I'd advise using 4-5), and then get going with writing some clear, paragraph-length chunks of text to follow them. 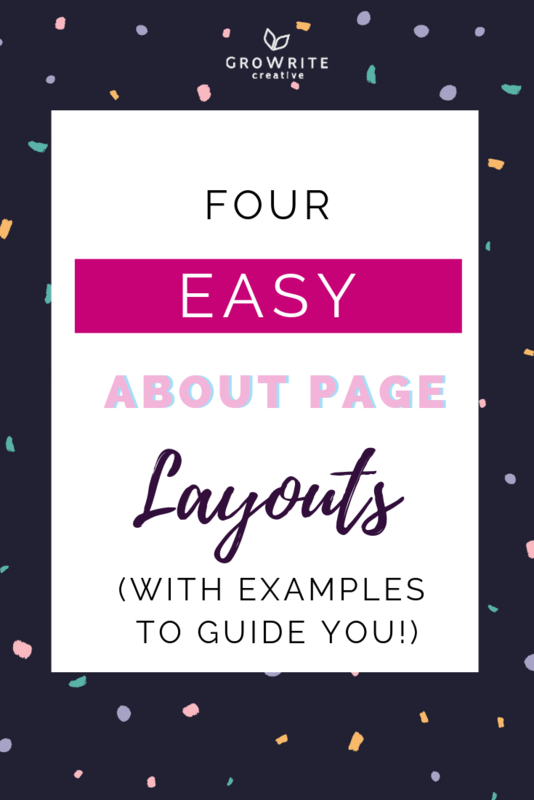 Finally, check out my FREE 4 P's of Personality-Packed Copy Cheat Sheet to ensure that you harness the power of YOUR unique personality on your About page too! 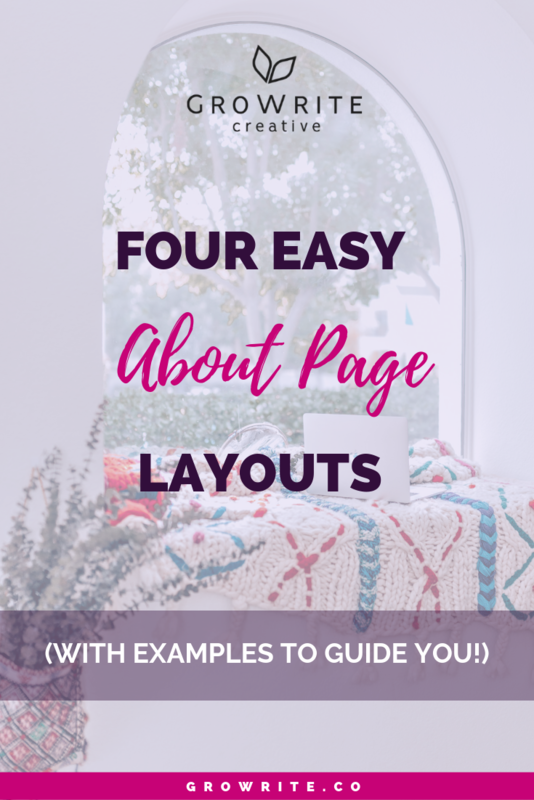 Which About Page layout do you plan on using for your business? Or do you use a different structure altogether? Leave a comment to let me know! And as always, if you know someone who could benefit from reading this article, please go ahead and share it with them! Are These Four Copywriting Mistakes Killing Your Sales? I help entrepreneurs like you use bold, personality-packed copy to make the spectacular impact and income they deserve. Learn more about what we can do together here. Want to get the Balanced Business Latte? Want to write copy that wins you more clients? When you sign up, you'll also get further marketing emails from me. Not your cup of tea? No problem. You can unsubscribe in a click.